The second one makes much more sense than the first and current way of doing it.. I say go with that! As people already understand the concept from Windows. I liken it to how you can select various items from Windows Themes/Sound/Background/Screensaver. I agree with cuz84d, the second one makes it much more clear how they will work. However, will there be other themes that work with personas? If so doesn’t that further complicate the matter if some allow it and some don’t? I’m curious – are there any figures on what percentage of Firefox users actually use either Themes or Personas? I also vote for the second option: As your introduction indicates there are two clearly seperate things. As for themes supporting Personas, it is very simple for a theme to support Personas, and acutally they should as Personas is now a standard functionality of FF. If a theme really wants to block/override this, the theme should indicate this clearly. Its confusing even currently when both are combined. Since enabling Persona disables theme., Have a check box to select use lightweight theme. Or at least show warning saying light weight theme use will disable current theme. Basically tell user that you can’t have both. …and if the theme doesn’t support backgrounds (and I believe the plan is that themes will have to explicitly opt-in to do so) then you can just grey out the “background” slot with a small explanation. Keep a record of what background is selected, so if they change the theme again, it can spring back in to life. ¹ More precisely styles for the scrollbars, tabs and other widgets. ² “Background” and possible override of the font colour and opacity of widgets and icons. The chosen theme should be customizable by freely changing any of the above, overriding whatever the theme uses by default. The main way of setting the above should be by choosing a theme, with the choice of saving themes oneself have customized as new ones. If a chosen theme is customized but not saved the theme should be marked as customized somehow but not deselected to signify that the changes have not been saved. Or the changed theme can be auto-saved with some default name. @Simon – I don’t have good stats on theme usage (though I think some of the more popular ones like NASA Night Launch have more than 10M downloads) but we’re seeing about 1 in 5 Firefox 3.6 users wearing a persona. @Simon – And probably 1 out 10 are using a theme, but that would be understandable as a theme is much more than just a fancy background, so only the more advanced users will use theme. We did collect some stats on theme usage back in September. Based on the update pings for a single day (a Wednesday) the actual stat is just under 7% of Firefox users use a non-default theme and those 7% have an average of 3 non-default themes installed. We should be gathering some similar numbers for personas soon. If the approach is heading towards #2, I am instantly reminded of the new approach that is used in Windows Vista/7 to set the current desktop theme and wallpaper. If the design is heading towards that way – is it the right way? I’d be curious to know how well this new approach is favouring Microsoft. Perhaps a blunder? Back when Netscape 6 came out (before I’d ever heard of Firefox), themes were prominently featured on its homepage. Really, no user could be unaware of them then; so I tried a few, liked the idea, liked some better than the default theme… the rest is history. 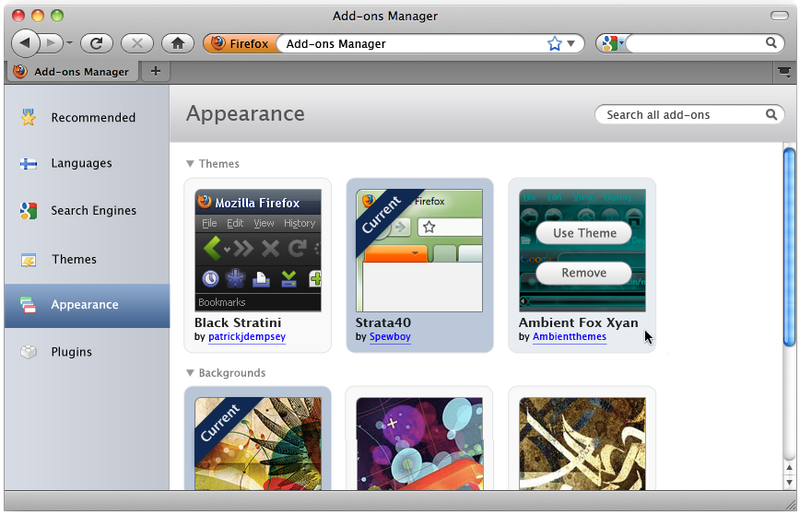 Of course when I learnt about Firefox I checked it for themes, and was happy to find an abundant set of them. Nowadays themes and extensions are simply not mentioned on the http://www.mozilla.com homepage; Personas are, but via a Flash or similar animation rather than a column of examples — more bandwidth required if you decide to click the “Start” icon in the middle of the “embedded TV”, and if you don’t, the possibilities are not even shown to you. 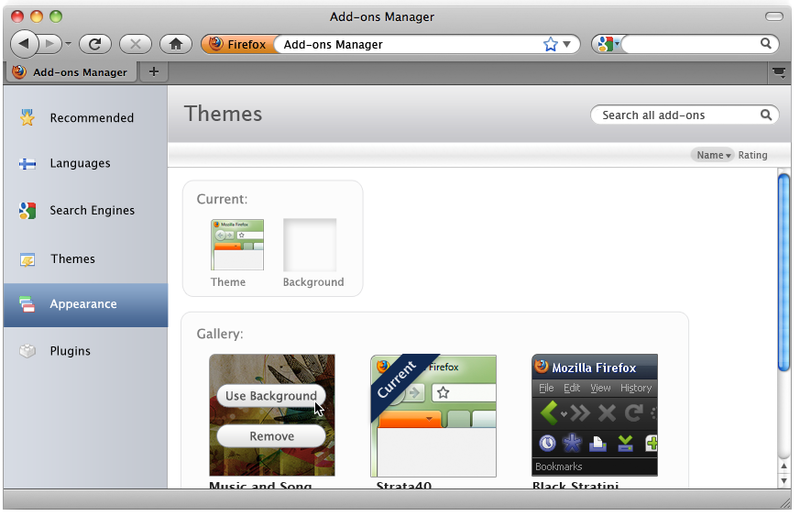 In addition, the subtitle to those Personas (“Instantly change the look of your Firefox with thousands of easy-to-install themes”) is bound to make newcomers believe that Themes and Personas are just synonymous when applied to Firefox. Glad you are using the word “background”. “Persona” is unique and trendy but it will be lost on my mom. “Background” and “wallpaper” are intuitive. The thing I don’t like about example 2 is that it mixes the themes and backgrounds into a single gallery. While it’s clear you can choose one of each, it’s confusing to have to pick through which are themes and which are backgrounds. I would prefer example 1 but have the “Current” items move to the far left when selected. Maybe “Current” isn’t such a good word either. “Selected” or “Active” or “Now Playing” might be better, and the ribbon across the top left corner almost seems like it might blend into the artwork of the theme or background too much – just a first impression I got. It would also be nice to have an empty box, at the end of each list of themes and backgrounds, that has a button in it to “Get More Themes” and “Get More Backgrounds”. Maybe have the “Current” ribbon or a “Current” stamp mark that extends over the edges of the thumbnail square so that it stands out more and doesn’t blend in with the thumbnail so much. Keep it simple. Windows 7 manages a group as themes better than previous editions of Windows, though the implementation needs to be refined. I do agree we that seperate lists for backgrounds and themes and a link for each stay in line of KISS methodology. And to know which one of each is current active (in use) would make it easy to keep track and change to new ones much like we do now. Disabled items don’t help to let you know its in use as it is now. The way it is now, the current method isn’t intuitive that you have to pick a theme then a background for it all to work, since it only looks like you can use a theme or a background. Regardless of the current usage.. back in the days of netscape it was really easy to find and get new themes, and you knew where to look. Now its no longer obvious to newbies and simple folk, its been too reliant on thinking that all people who use firefox are also resourceful enough to find themes or smart enough to understand Firefox’s ways. The real adoption rate comes from KISS with UX line up. I was under the impression that you had to use the default theme to use personas. I have tried personas with other themes and the browser resorts to default. This is definitely a case of TOO many choices. Very nice article and very informative.